Occupy Wall Street found a new home today—not a new park, or a plaza, or a square, but a house. 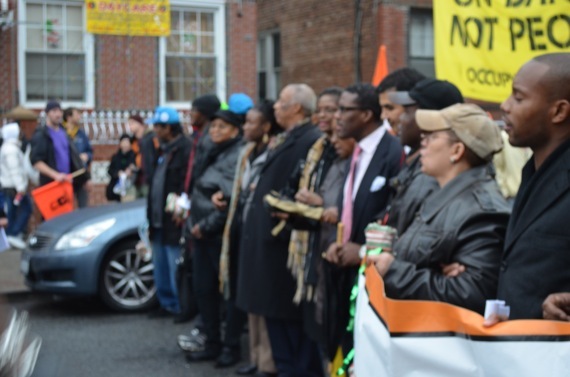 Just weeks after the eviction from its encampment in the financial district, hundreds of occupiers joined local community members in a foreclosure tour of the East New York neighborhood of Brooklyn through the rain, which concluded with a celebratory block party as a family reclaimed a foreclosed home owned by Bank of America. It was one of many anti-foreclosure actions taking place in communities across the United States today. The General Assembly and its related working groups are only able to do so much on their own. Without the focal point of an encampment anymore, the movement’s actions will rely more and more on coordination with institutions more firmly entrenched in neighborhoods where it works—as well as, despite the movement’s own leaderless structure, those institutions’ leaders. While occupiers have almost always welcomed the support of outside organizations cheerfully, today I heard grumbling among some of the older ones who have had negative experiences with this or that public figure in the past, and who are suspicious of traditional institutions as a whole. A City Council member might stand with the movement one day, but what will he or she expect from it on election day? And how far will a given non-profit organization go with civil disobedience before it starts to scare away its funders? These are new questions that the Occupy movement will be facing more and more. The answer, though, seemed clear to me when I passed an activist running from the soon-to-be-reclaimed house with a drill in his hand—which presumably had been used to bypass the lock. With the march came a team from Occupy Wall Street’s Sanitation Committee to clean up inside the house. Outside, the occupation’s library and kitchen set up shop, along with teach-ins and a piñata. The answer I had in mind, that is, is direct action. As long as this movement keeps nonviolent direct action at its center, refusing to wait for the powers that be to approve of the undertakings it deems necessary, its momentum will continue to grow. Politicians and non-profits will join the cause not so much because they see an opportunity for themselves but because they can’t afford not to. Without the need to focus on encampment sites, furthermore, the attention of Phase II is much more carefully oriented around root causes, around the very means by which the movement’s corporate opponents perpetuate themselves: foreclosed homes, ports, rampant consumerism, and more to come. 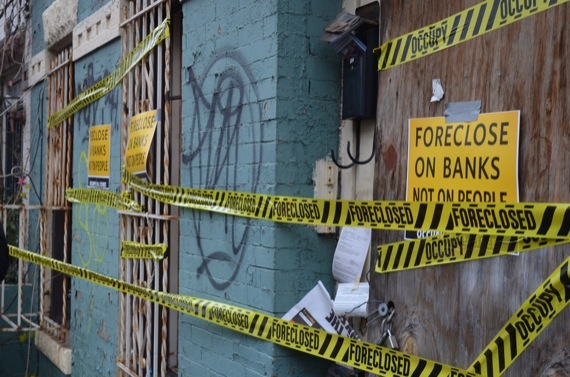 Foreclosures, as ground zero of the 2008 financial crisis, are a fitting place to start. They’re also where the often-abstract machinations of Wall Street actually hit home for many Americans. By preventing them, or reversing them, the movement will find new allies who were less moved by the earlier talk of ending corporate personhood or imposing a Tobin tax.